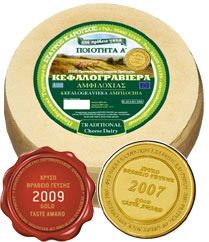 Table,hard, mature cheese, product of a traditional recipe with a superb, rich and spicy taste. Exclusively producedby Amfilochia's pasteurized ovine milk and packed, when it becomes mature, in bags of 9-12 Kilograms. It could be pleasurablycombinedon the table with red wine and it is perfect for cheese ramekin.